"Turn off the lights," said the Wabbit. The lightbar flickered and died. As far as the eye could see, there were blue snails and they all whirred gently in the light of a red moon. "Police! Let's split," shouted a snail. "No, we can take them," shouted another. Skratch watched all this with interest. "What's a group of snails called?" The Wabbit lifted a paw. "A rout. Wait." A series of instructions rang out and the snails whirred to a halt. Two larger snails emerged from the rout and slithered to the car. "Commander!" 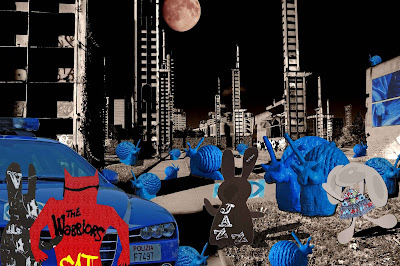 The Wabbit's 28 teeth grinned ear to ear. "Mo and To!" shouted Lapinette. "We are ..." said Mo. Their antennae wiggled alarmingly. "... the Snail Gang," said To. 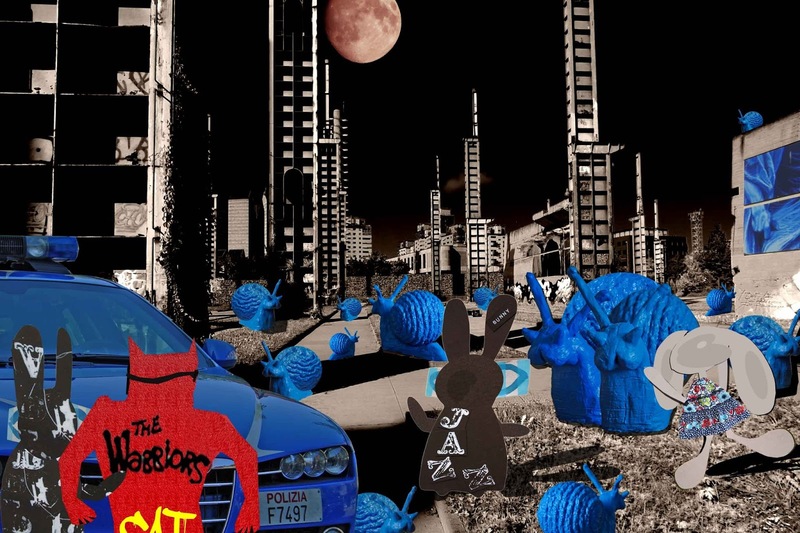 It had been more than a year since the Wabbit heard from the MoTo Snails. The MoTo snails were punk snails with attitude. Retrofitted and high speed, they were formidable foes. "What's with that old devil moon?" drawled Mo. To whined punkily. "Is that your razzle dazzle, Wabbit?" The Wabbit spread his paws and shook his head. "It's got everyone freaked," said Mo, "that and the hairy heat." "We don't like it hot," said To. "Except for the car. It looks like it might be hot." Skratch waved a paw. "We temporarily removed it from its parking space." "That's cool," breathed To. But the rout whirred uneasily, then girders glowed as the blood moon pulsed. The Wabbit looked up. "Let's find cover." He paused and thought. "What time is it?" But no-one knew.